Since the majority of label printers are designed for industrial environments, when properly maintained they can be in operation for several years. Therefore choosing the correct thermal label printer for your application is critical and choosing the wrong label printer for your application can be very costly, can leave you disappointed and unproductive. Several factors should be considered when selecting a label printing system. One of the primary factors for selecting a label printer is choosing a printer that can handle the quantity or amount of label material you are going to print each day. Other factors of consideration is the type of material you are going to print on, do you need stand-alone printing or need to be attached to a computer and how much space do you have available for the label printer (footprint). 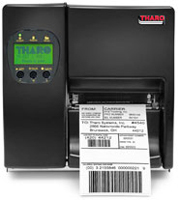 A rugged label printer designed for high volume label printing in a variety of environments. Commonly constructed of metal and aluminum the Industrial Thermal Label Printer is designed to withstand the heavy work load expected in an industrial location. For label printer selection that's right for your application, Ohio Identification Solutions is your expert source for thermal label printers and can offer factory trained advice and first hand solutions experience to create a thermal label printing system for optimum performance and longevity. Personal assistance from our hardware specialists is just a phone call or click away.